Back in the early part of the winter, I spent a bit of time digging more deeply into the history of Westboro Beach. I had the great pleasure of being asked to present at the Westboro Beach Community Association AGM in December. For this, I put together as many interesting photos and stories as I could on the area in the 1800s, when it was not exactly a beach. What is great about this topic is that many present-day residents are shocked to learn that the area and land had a much different use back in this era, which indeed gave Westboro its auspicious birth. Prior to 1870, there was very little development west of Hintonburg. There were farms off of Richmond Road, but no trains had arrived yet, and any attempts to sell land or promote new subdivisions were losing battles. 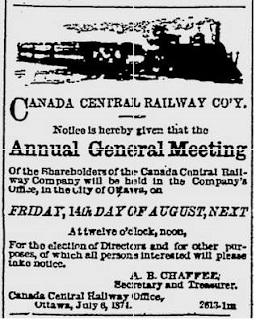 However in 1869, the Canada Central Railway announced they would be opening a rail line from Lebreton Flats west to Carleton Place. The line would run more or less alongside the Ottawa River until past Britannia, and then cut south through Nepean Township to Carleton Place. This meant that trains would begin to appear steaming through the farmlands of Kitchissippi. 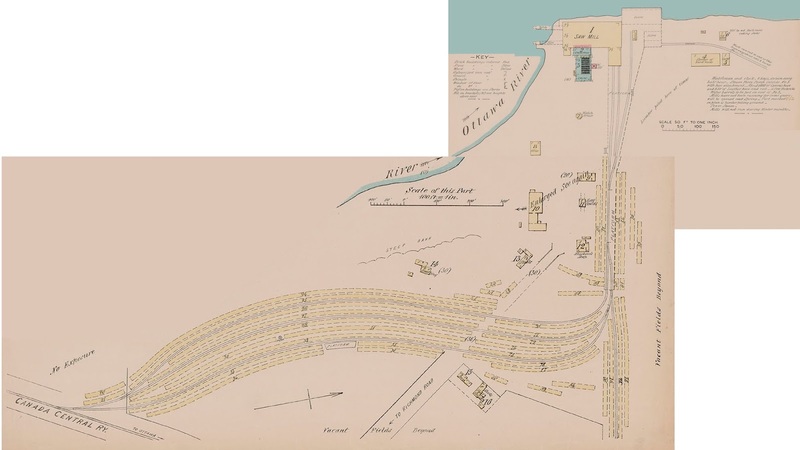 Deals were struck with farm owners to acquire tracts of land for the tracks to run through. Or, in the case of one lumberer and investor with a little inside information, shrewd deals were struck to acquire the land surrounding the forthcoming track. James Skead in 1869 was a Canadian Senator, and had been one of Ottawa's most prominent and successful businessmen and citizens over the past twenty years. 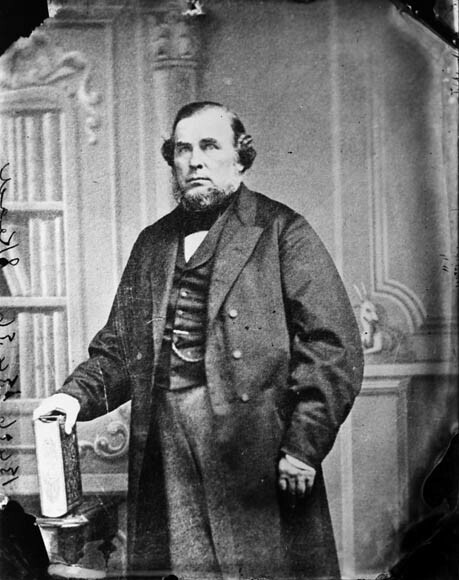 He was born in England in 1817, and came to Canada at the age of 10, not long after his Mom had passed away. The family settled in Montreal first, then Bytown a few years later. In his 20s, he started in the lumbering trade, and invested in business along the Madawaska River. He took in his first haul, a swath of red pine, in 1843. He became an expert in river works, and constructed innovative slides at various locations including Bytown. He was prosperous from the beginning, and held an incredible number of titles over the years. 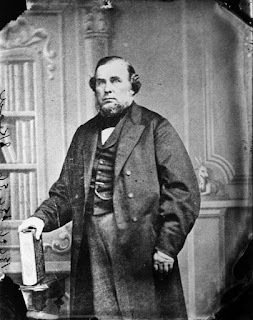 He sat on the first Ottawa Board of Trade elected in 1857, was President of the Dominion Board of Trade, President of the Ottawa Agricultural Insurance Society, President of the Ottawa Iron and Steel Manufacturing Company, President of the Ottawa Agricultural Society, President of the Upper Ottawa Steamboat Company, and a director of various groups including the Ottawa Association of Lumber Manufacturers, Madawaska River Improvement Association, Ontario Fruit Growers Association, the Ottawa Immigrant Aid Society, the Ottawa Rifle Association, the Rideau Club, and various shipping and rail companies. That isn't even the complete list, I omitted many others. His heart was with agriculture, and he was known for his imported rare Ayrshire cattle, which he exhibited at fairs. 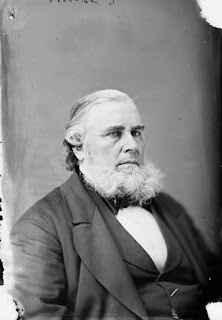 Politically, he was involved on Ottawa City Council in 1861, then represented Rideau in the Legislative Council of the Province of Canada from 1862-1867 (pre-Confederation). 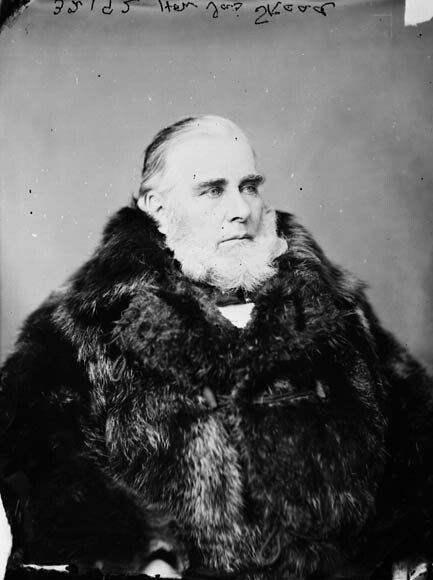 In 1867, he lost his election for his seat in the first Parliament, but was appointed to the Senate by Sir John A. MacDonald, as a reward for his contributions politically and in the lumber business. His real estate holdings were significant. At one time he owned approximately 450 acres of land west of what is now Holland Avenue (which he had begun accumulating in 1859), not to mention much land in Ottawa and elsewhere. One of the more interesting buildings that was once his is the stone building at 541 Sussex (corner of George), which has a history dating back to 1837 as a log tavern operated by Donald McArthur. Skead acquired this in 1862, and over the years it has existed as the British Hotel, the Imperial Garrison Barracks the Clarendon Hotel, and as the birthplace of the Royal Academy of Arts and the National Gallery of Canada. It is probably best known as the home of Geological Surveys of Canada for many years, and remains today as a prominent heritage building in the Byward Market. Back to Kitchissippi, the Thomson family (they of Maplelawn on Richmond Road) began to experience financial issues in the 1860s. By the mid-1860s, they had begun selling off their excess farm land, even offering up Maplelawn in 1867. William Thomson died just after Christmas of 1867, and his sons took over the estate and property. 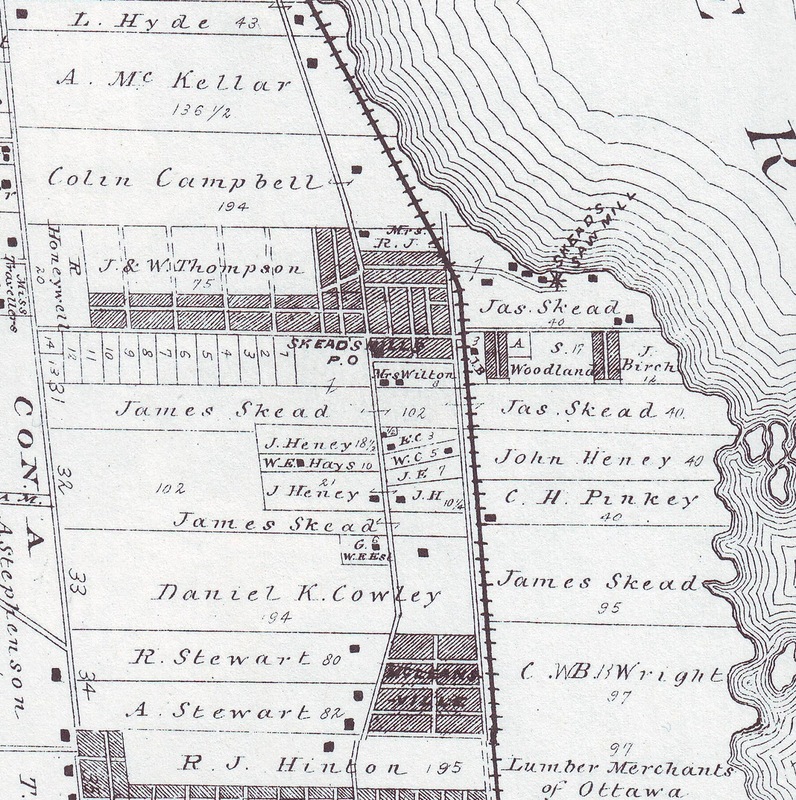 They would attempt to sell builder lots in a subdivision they called "Baytown", and did what they could to keep up the farm, but ultimately the Thomsons lost everything a few years later in 1878 (more on them at a piece I wrote in the fall: https://kitchissippi.com/2016/11/24/westboro-pioneers-founding-family-thomson/). So in 1869, the Thomsons were probably quite glad to find a buyer interested in part of their farm. James Skead purchased just under 75 acres of land from the Thomsons on December 15th, 1869 for the oddly specific sum of $6,351. This was all of the land in "concession A" of lots 29 and 30 in Nepean Township, essentially everything north of what we now know as the Transitway, from Churchill west to about where Golden/Dominion now run. That same month, Skead also purchased two nearby pieces of land in the east half of lot 31 from lumberers Merrill and Currier, totaling 79 more acres. Skead was obviously buying up as much land in the vicinity as he could, smitten with the real estate prospects of this rural vacant land. owns a large percentage of the land in the area. 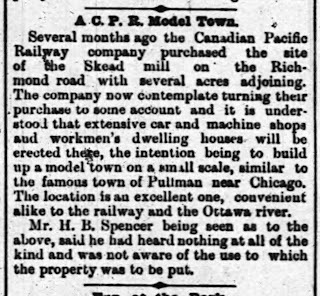 However, what Skead also knew (since he was Vice-President of the Canada Central Railway) was that the new rail line would be coming through this property; the first rail line running west, and the first line running through Nepean and Kitchissippi. The opportunities to build around the line, run spurs off the main line for shipping, etc. were infinite. 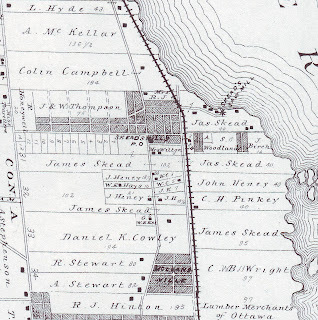 Skead with his extensive background in the lumber trade fancied the Westboro Beach area as an ideal spot to erect a mill, and immediately set about its construction. By mid-1870, Skead's first mill opened, at a cost of approximately $50,000, and was "fitted with all the most recent improvements". 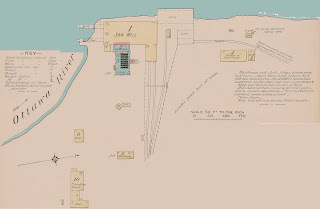 The mill building measured 152 feet long by 46 feet wide, erected right on the shore of the bay (then known as "Thomson's Bay"), close to the water. 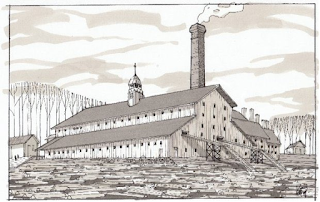 The mill employed about 40 men, and could saw 15 million feet of board in a season. It was used primarily for the cutting of wood for lumber, lathes for home construction, and shingles. One of the biggest concerns of the era for anyone, home-owner or business-owner alike, was of course the threat of fire. One small spark and an entire operation could be turned into ashes. 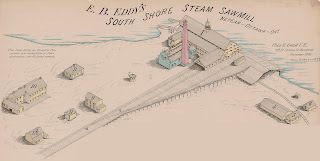 Skead took all the precautions he could against fire: he had a night watchman under his employment each and every night; a powerful steam pump ready at all times to deploy water; the engine house and boiler house were constructed as separate stone buildings; and Skead also enacted strict policies against smoking on the property. The mill instantly created a small community in the area, and gave the Thomsons a little life in their Baytown subdivision, though more so to the Birch's 1860s subdivision east of what is now Churchill, which they had called Birchton. September 16th, 1870 was the first official train of the Canada Central Railway from Lebreton Flats to Carleton Place, and instantaneously, the future Westboro was born, beginning life as an industrial hamlet along the River. On Halloween night of 1871, Skead's mill closed at the usual time of 6 p.m. The workers left, and the night watchman came on duty. There was nothing out of the ordinary on what was likely a quiet, cool evening. At approximately 3 a.m., the watchman discovered a small fire which had begun suddenly in the "refuse and saw dust" under the main shaft of the year-old large wooden mill. He threw water on the flames using nearby buckets, then ran to the boarding house where the workers were sleeping. By the time he and the groggy mill employees arrived back to the fire, the flames were burning through the mill. The night was very dark, with a strong wind blowing north. The men tried very hard to save the engine house and boiler house, in order to keep the water pumps going. They succeeded by blocking the windows with wet blankets to keep the flames out, while also pouring a continuous stream of water onto the building. Others tried to enter the mill to save the tools and parts of the machinery, but were unable to do so, driven back by smoke and heat. 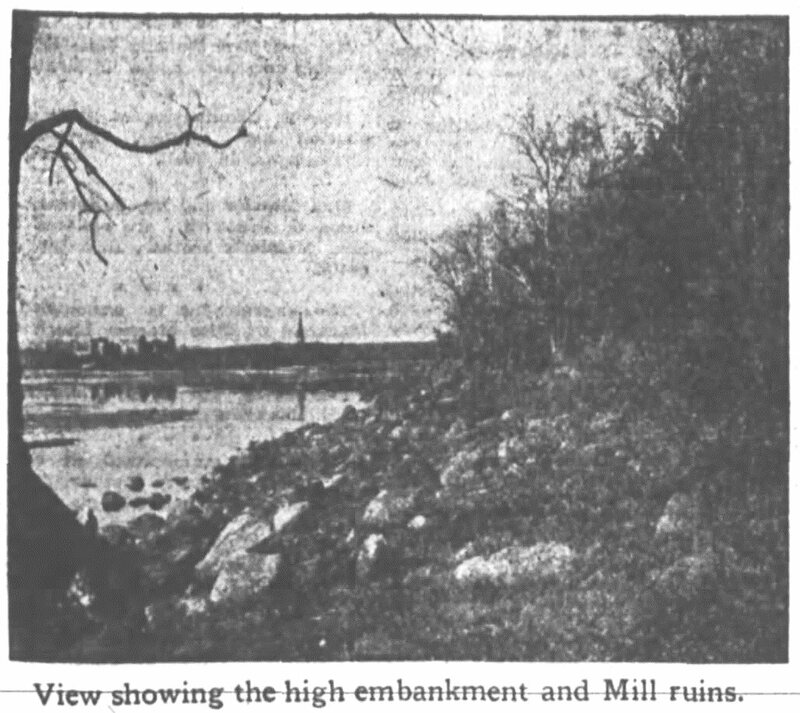 By the vicinity of the mill were piles of cut lumber/lathes/singles; these caught fire as well. A large amount of sawn timber that had been prepared for construction of railroad bridges and some "superior long square timber" for the English market was destroyed. Eventually, the workers had to abandon saving the mills, and put their efforts in to saving the piling grounds. Thankfully, the strong northerly wind saved the majority of the lumber, as well as the office and some of the adjacent buildings. By daylight, the mill was a "smouldering heap of blackened cinders". The workers continued all day on November 1st to keep the smouldering ashes from re-igniting and spreading to the piles. In the end, 230,000 feet of lumber was destroyed, plus many more rendered worthless by being charred at the ends. 60,000 laths, and 40,000 shingles were also consumed, a total of over half a million board feet. The loss was estimated at $40,000. Skead had insurance, but it was minimal. He had $20,000 in insurance from four carriers ($4,000 from Etna, $4,000 Hartford, $4,000 Provincial, and $8,000 Royal), plus $15,000 of insurance on the lumber itself. However, the insurance was distributed over the various buildings and machinery, some of which was saved, so the insurance was to only cover about a quarter of the loss, not to mention the loss of business. 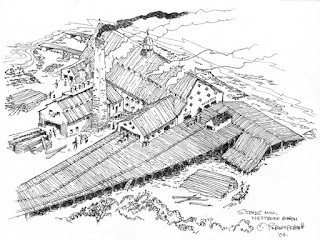 Skead had been improving the mill over the year it had been open, and estimated that more than that insured amount had already been invested into it. Skead told the Ottawa Free Press that he would not have sold the day prior for $80,000. The morning after the fire brought many visitors to the scene. "Yesterday the ring and scream of its great circular saws were heard far up and down the water and the Richmond Road", reported the newspaper, but the area was silent on November 1st. The origin of the fire was rapt in mystery. Skead believed the cause to be the overly liberal use of oil around machinery, with the oil mixing with saw dust, causing spontaneous combustion. However, others thought that the fire was the work of an incendiary "evilly disposed towards Mr. Skead or some of his people". The fire was reported on throughout Canada and the United States, and no official cause was ever noted in the media. In further evidence of his dedication to the people city of Ottawa, the Globe and Mail reported that later that day, Skead had an important meeting in Ottawa which he still attended. 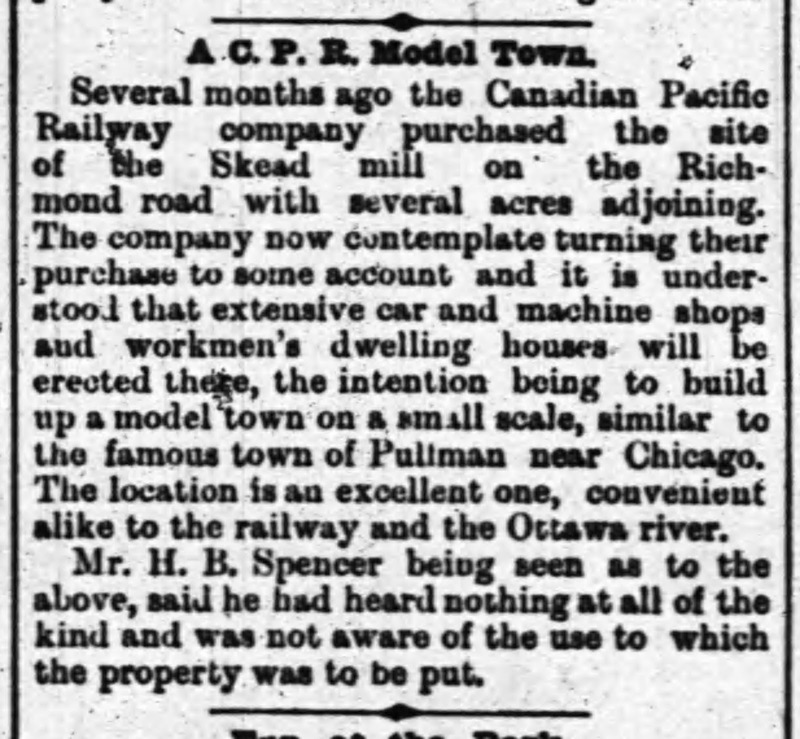 Skead, along with other key businessmen, were to organize an independent group (society) to procure immigrant labourers and servants for Ottawa and the area (the society had $15,000 available to pay travel money to bring workers here from Great Britain). Skead was appointed as part of a committee to draft a constitution that afternoon, mere hours after he suffered his devastating financial loss. Skead decided to rebuilt right away, and records show that it may have been up and running by late 1872 or early 1873. Very early reports indicated that Skead intended to be up and ready "in days", but clearly that was overly optimistic. 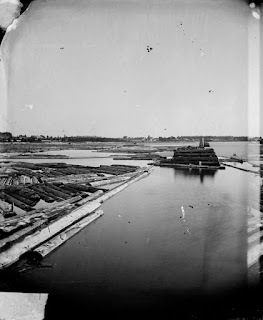 A rare 1873 photo of the vicinity of the new mill, within the first year of its construction has survived, and can be seen below. 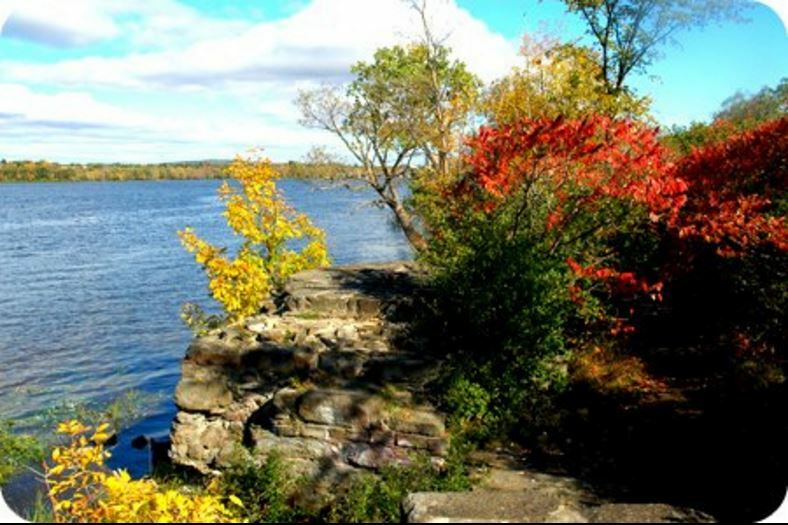 The log booms in the Ottawa River are visible, and some mill buildings can be seen in the distant background. September 1873 view of the log booms by the new mill. The name "Skead's Mills" would be selected in 1874 as the name of the new hamlet that had sprung up around the mill property. The locals applied for, and received a post office up on Richmond Road. When the first post office opened there on May 1st, 1874 in Rebecca Pratt's shop, it opened under the name of "Skead's Mills", honouring the Senator. A telegraph station was opened soon after. Unfortunately for Skead, the economy was poor, and the timing of the fire and the expensive rebuild was very unlucky. An international trade depression began in 1873 and lasted for five years. Skead fell victim yet again, though to a different foe. By 1877, Skead had run up a real estate mortgage to the Merchants Bank of Canada of over $243,000. A year later, he had to surrender ownership and walk away. In July of 1878, the Bank took over the property, and it appears the mill stopped running for a brief period. In November of 1880, Skead and his wife Rosina purchased the impressive stone house on Richmond Road, which is now better known as the Convent, just west of Island Park Drive. The house had been built 15 years prior, and Skead became its third owner. Though he had suffered significant losses at the mill site just to the northwest, he clearly had an affinity for the area, moving in to the Convent house on the small 6-acre property then known as "The Elms". Skead resigned from the Senate in January 1881, as he did not feel confident continuing in his role after suffering from years of extensive financial difficulties. However, he was called again to the Senate later that same year by Sir John A. MacDonald, where he served until his death. In 1882 his lungs were seriously injured when he was thrown from a moving carriage. He was forced to largely retire from business, though in May of 1884 it was announced that Skead was to be appointed Post Master (I do not believe he ever took on the role). A few months later, Skead died at home on Richmond Road from his lung ailment, July 5th, 1884. His financial state at the time of his death was poor, and within a couple of years, his widow Rosina watched as most of the elements of his estate were foreclosed on or sold to pay back debts. This included The Elms (the Convent house), which transferred back in 1886 to the executors of George Washington Eaton, who had sold the house to the Skeads in 1880. (The Hollands would purchase from the executors a year later, though this story is best left for a focused article on the convent property itself someday soon). On May 2nd, 1888, the final shreds of Skead’s great financial empire was sold off via a Judicial Sale. The Sun Life Assurance Company had foreclosed in a judgment in March, and so 5 parcels of Skead's land transferred to them: the east half of lot 31 south of Scott (77.25 acres); the east half 31 north of Scott (46 acres); the south half of lot 32 south of Scott (100 acres); and the north half of lot 32 south of Scott (18 acres). 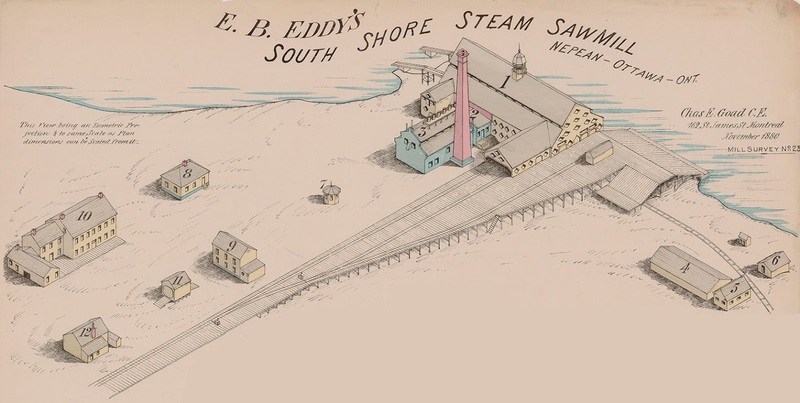 Meanwhile, back at the old Skead's Mills site, the mill itself had been purchased at sale by the E. B. Eddy Company in September of 1880. It then changed hands a few times over a short period. Eddy sold it to Allan Grant in 1882, who mortgaged from the same Merchants Bank, then Grant sold to the British and Canadian Lumbering & Timber Co. Ltd in 1883, before Eddy repurchased in May of 1884 from Merchants Bank again for $100,000 after they foreclosed on the BCL&T Company. It is difficult to say if the mill had been out of operation at any point during this period. However, it is certain that by the summer 1884, the mill was running full bore under the direction of E.B. Eddy. would be roughly the location of Kirchhoffer today). 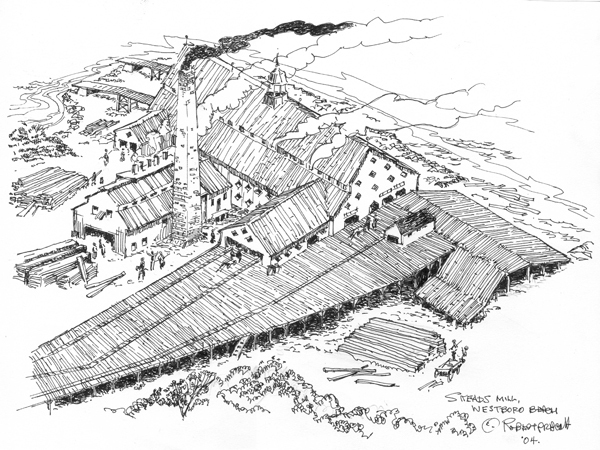 These plans were the inspiration for two local artists who brought the mill to life through their modern-day illustrations. 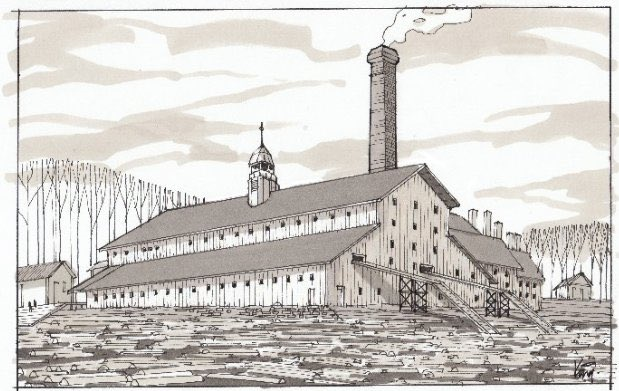 The evening of July 31st, 1888, a small fire had broken out at Booth's mill at the Chaudiere. Catastrophe had been avoided there, but Eddy's mill at Westboro would not be so fortunate the following day. At 2:30 p.m. in the afternoon of August 1st, a spark hit the sawdust and shingles under the platform of the mill. Everything then happened quickly, “the flames leaping like a loosened giant and paralyzing the best efforts of the workmen”. "The whole mill became alight in one instant” said one worker. Nelson Lascelle, a young boy working at the mill, had backed his cart up to the gangway on the south side of the mill to load up, when he discovered the fire, which he stated was only the size of his hand. He jumped off his cart and gave the alarm. By a terrible stroke of bad luck, the fire had started exactly by where the hand-engine for use at fires was situated, and thus the hand-engine and its shed were the first to burn. Frantic calls of “Fire, Fire!” went up, and all hands were on deck to fight the blaze. The emergency steam whistle began to blow (the engineer spread the valve wide, tied a string to a post and fled), and ran its shrill warning for half an hour until it was consumed by the flames. A stiff breeze came in off the river “fanning the fire by a thousand different breaths”. Buckets of water from workers could do nothing. Within seconds, the largest and fiercest fire ever in the Ottawa area to that point had begun. The office adjoining soon went up, then the storehouse (with blankets/provisions), followed by the stables and blacksmith shop. Efforts were then turned to protecting the boarding house (as men made frantic attempts to remove bedding and miscellaneous personal items), however “one gigantic wave of flame from the mill struck it, and in five minutes the boarding house was reduced to a pit of ashes as well as a large shed adjoining”. Flames and smoke could be seen by all Ottawa and Hull residents. Hundreds from the city and area came, many offering help, but many there as "sightseers". The fire began to move south and east, threatening the enormous lumber piles and the CPR freight cars on the track nearby. The E.B. Eddy steam-powered fire engine arrived early via a special train on the CPR. It was quickly brought down to the edge of the river, fifty yards from the mill. Its hoses were stretched, it was steamed up, but by that point the fire was too large and had moved further away to the lumber piles. The 300 feet of leather hose attached were useless. Then after 5 p.m. the Union engine came out. It had been called for just after mill caught, but it was over two and a half hours until it arrived, when the full property was already doomed. The Union set up 20 yards further into the bay, further up the lines of piles. It had 2 reels of hose, and briefly helped contain the fire within the yard. 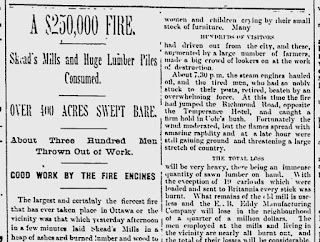 Meanwhile the fire spread 800 yards to the lower end of the site; at one time 1,600 piles of cut lumber were on fire, with smoke pouring 300 feet into the air. Fire moved across the CPR track, burning the ties and curling the rails into odd shapes. In all, half a mile of track burned. At its peak at 5:30 p.m., the fire had a circumference of 3 miles. The media would report the fire the following day in descriptive terms, such as: “Occasionally a gust of wind would blow from the lake, causing the flames to roar and bellow as if taunting the puny efforts of the firemen to make a break in the torrent of flame”, and “The smoke was dense and rolling off in heavy impenetrable black clouds, with the background of fiery flames rising majestically, reminding more than one of Dante’s description of the infernal regions”. Soon the brush on the south side of the track caught fire (equivalent of where Scott Street runs today), and suddenly the houses along Richmond Road were in serious danger. Many made efforts to stop the fires progress by creating gaps, but the strong winds would carry it south. Eventually the full 40-acre property north of the CPR tracks was burnt out, and the fire was raging on the south side. By 7:30 p.m., the fire had jumped Richmond Road, opposite the Temperance Hotel (by the corner of Churchill Avenue), and caught a firm hold in Cole’s farm/bush (the current area west of Churchill, south of Richmond Road). It began to spread quickly, jumping tree to tree, and suddenly a second large fire was raging. The residents of early Westboro began frantically moving their household possessions and furniture into the street and carrying them to a safe locality. John McKellar sent his wagons and horses up Richmond Road to collect and move people's items to his farm for safe-keeping, and Mr. McCormack the postmaster of the village also was using the wagons at his disposal to move personal effects. As occupants lost their houses, they began to help others try to save theirs. The newspapers reported that women and children were seen crying, holding on to the few meager possessions they could grab. The resident's stacked-up items would be saved in the end, but the following day, the residents had to go sort through the piles of items to find their possessions, most of which were badly damaged during the panic. George Holland and his wife (who were now living in the Convent) were also early on scene and helped the villagers in their efforts. It was noted George was especially active in saving the old school house on Richmond. His wife Alison provided shelter, water and other necessities to the villagers. Thankfully, the the winds began to died down at sunset, which helped tremendously, though several houses were eventually damaged or burnt entirely. The foreman's house closer to Richmond Road was saved, as well as most of the houses on or past Richmond Road. Virtually all of the dozen houses north of Richmond Road were destroyed, and 30 people left homeless. Some were still camping out days later; the newspapers reported that some were living on the site of the road, without even a tent or any necessities of life. “In some cases a counterpane placed over a ridge pole is all the shelter they have”. 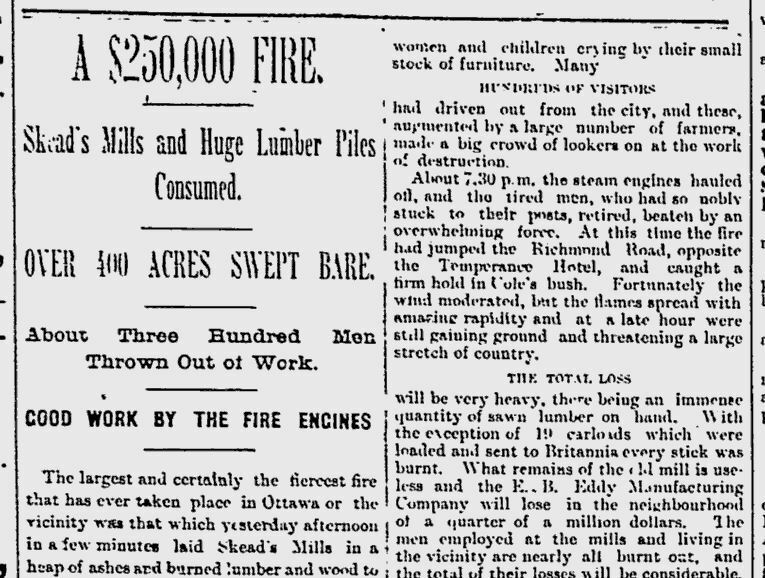 When the fire was through, hardly any of the 7 million feet of lumber survived. All had been pre-sold (at sellers risk until shipped) to the Oswego Lumber Co, Shepherd & Morse of Burlington, and the Canada Lumber Company of Burlington. In the end, it was said that just four partly-burned piles of lumber were all that remained on site, while 19 carloads had been loaded on the tracks and sent to Britannia. Estimates of the damage for the Eddy Company included the following calculation: $40,000 purchase price, over $20,000 in new machinery added, new office valued at $200, boarding house accommodating over 100 men valued at $3,000, store house/supplies at $3,000, blacksmith shop of $300, and stables at $400. Thus a total loss of real property of $66,900, plus 7 million feet of lumber valued at $120,000, for a total of $186,900. It was said that $1,000 worth of lumber had been burnt per minute that the fire raged. Some reports in the States put it at a loss of anywhere from $300,000 to $500,000, though those reports were greatly exaggerated. The Canadian Journal of Commerce confirmed later in August that the final loss was $175,000. Insurance on the mill and buildings was $50,000, and on the lumber at $60,000. Therefore the net loss to Eddy was $65,000. Incredibly, there was no loss of life in the fire. 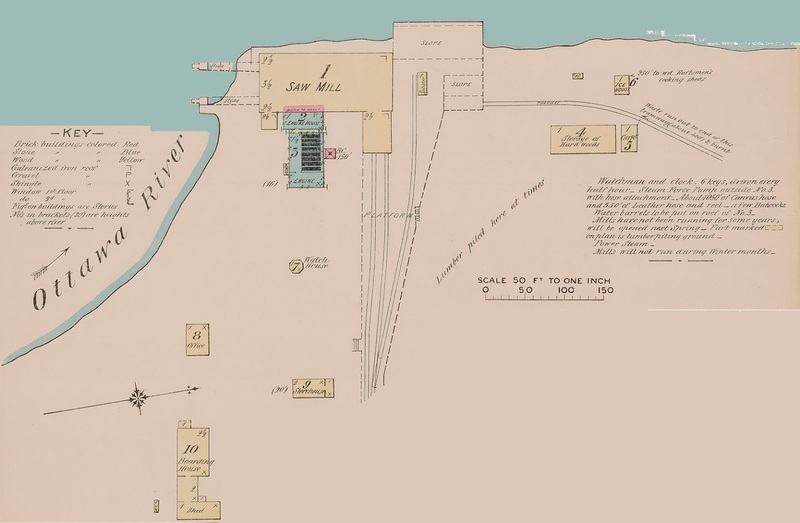 There were many reports across North American newspapers of deaths (including one major newspaper which reported that three men and two boys had been lost in the shingle mill), but all workers and residents were accounted for. There were a few injuries. A young worker, Joe Berry, was badly burned on his neck, face, and hands, while six or seven other men were "scorched". One boy (William Stewart) had to jump from the upper window with his clothing on fire and was badly burned. He was reported as having been taken home “insensible”. Andrew Hobbs could not locate his son William Hobbs (an 18-year old slab-cutter) during the fire and went to look for him. He was overcome by the heat and fainted, and was taken away in a cart. William Stewart was reported dead in many US and Canadian newspapers, but had actually survived. I wonder if he ever got ahold of a copy of any of the distant newspapers which reported his being burnt to death? The cause of the fire was confirmed by E.B. Eddy to the Ottawa Free Press a few days later to be a spark flying from the furnace, despite all the precautions taken. Others who worked at the mill believed it was more likely someone who had lit a pipe and carelessly discarded the match which caused the fire, though this was never substantiated. Smoking was of course strictly prohibited, the penalty for which was immediate dismissal. Two months earlier, a spark had ignited the saw dust in the same area, but was discovered and put out quickly. The roof of the storehouse had also become alight at one point that summer, but was also put out. It seemed a major fire was practically inevitable. The cause potentially also may have been sparks from nearby bush fires. The week had been particularly warm and dry, and bush fires were raging in nearly every point around the city (Aylmer, Billings, Montreal Road, Orleans, and even one on the Stewart estate south of McLeod between Lyon and Bay). All side tracks for the CPR were ruined, and the main line of was also damaged. All train travel was suspended. The morning train from Toronto was delayed at Stittsville, and had to wait two days to get through. CPR telegraph poles were destroyed, and the CPR sent out a special car which had field telegraph equipment, to connect with the portion of the line unbroken, and wire dispatches from that temporary location. The workers of the mill were an upset bunch throughout and especially after the fire, as they realized their work and home and few possessions were all lost. Even their paycheque owed was up in the air; the day after the fire was to have been pay day. The citizenry of Ottawa also felt the effects, as the significant loss of wood created a major shortage in Ottawa, leading to price increase in town. At the end of it all, only the tall and blackened chimney remained, which “stood out as a sentinel” over the wide area of desolation that was once Skead's grand mill. 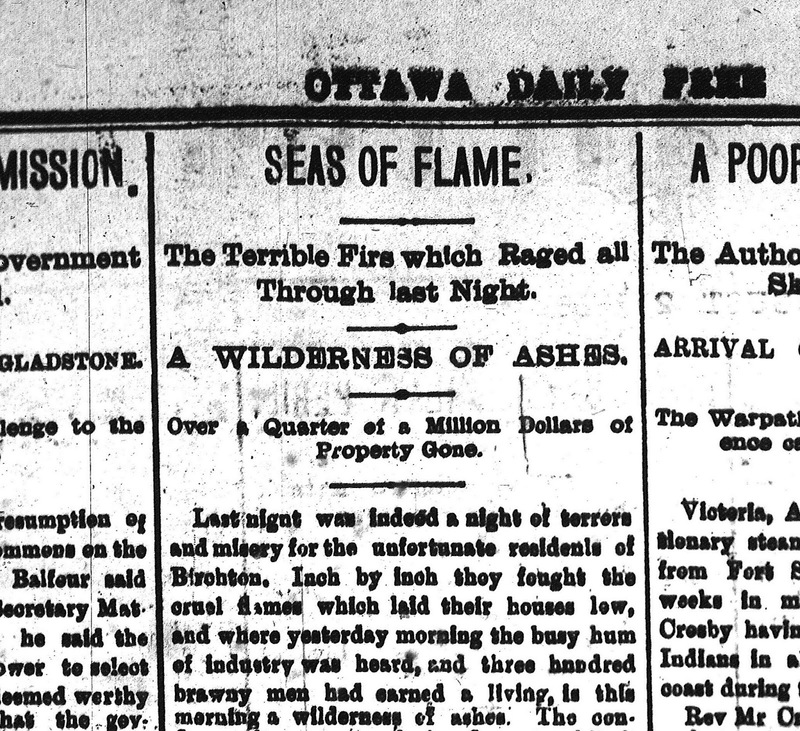 The fire prompted an editorial that weekend in the Journal, which noted that Ottawa had an efficient and near flawless fire protection system, and was not as susceptible to a major fire as a Montreal newspaper had predicted, that Montreal “will be aroused from its fools paradise by a big conflagration”. The editorial noted that Ottawa (the city limits) rarely had fires, and had a smart chief and faithful group of high-quality firemen who always ensure that "the fire gets no chance". 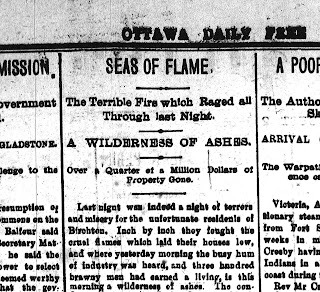 The paper took exceptional issue with the reporting of some of the suburban/rural fires, including the Skead's Mill fire as "Ottawa fires", “strengthening the erroneous impression that there is an extraordinary risk in carrying on business or living in Ottawa”. This false confidence would of course be proven wrong just a few years later when the major Ottawa-Hull fire of 1900 nearly wiped the city off the map. Meanwhile, a month later on September 5th, 1888, the mill site and property was offered for sale at an auction at the Russell House hotel. Eddy put up for sale the blackened land, as well as the bits and pieces that had survived: the brick chimney, the refuse burner, the foreman’s house and stable, and the walls and foundations and equipment/machinery that were “more or less damaged”. No bids were made, and the sale was postponed. Eddy would eventually find a buyer for the mill property on July 17th 1890, when he sold to the Ottawa real estate firm of Mutchmor-Gordon. The agents flipped the site a year later to the CPR for a tidy profit. (Mutchmor-Gordon used their profits on the flip on an agreement to purchase Maplelawn on Richmond Road and some of the adjoining Highland Park Dairy Farm, however changed their minds and invested in the Glebe instead). The CPR announced it was considering building “extensive car and machine shops and workmen’s dwelling houses” on the site of the mill, the intention to build a model town on a small scale similar to Pullman near Chicago. The CPR did not go through with this plan, and also refused to sell the land for many years. It would not be until 1909, that the CPR agreed to sell the old mill site. Senator John N. Kirchhoffer in November 1909, purchased the full 70-acre site for $42,500. Kirchhoffer immediately subdivided the land and created the "Clarella Park" subdivision, which laid out the Westboro Beach community that we know today (aside from the obvious changes due to the establishment of the River Parkway in the 1960s). 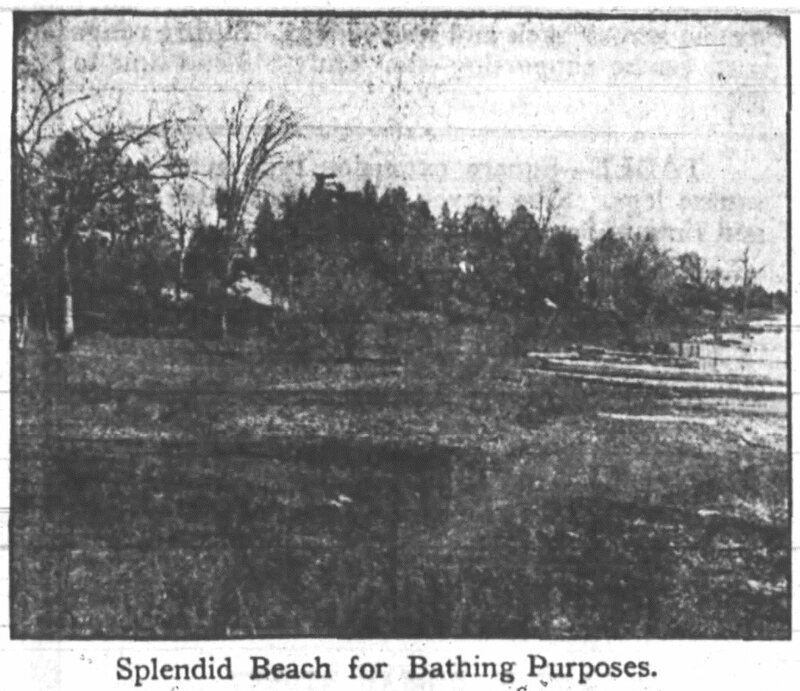 The modern day history of the Westboro Beach community deserves an article all its own, and I'm sure someday I'll cover more of the 20th century history. In the meantime, if you don't already own it and/or haven't read it, I highly recommend getting your hands on a copy of Bob Grainger's "Early Days of Westboro Beach" book, which tells the full story of the community (and the beach) with lots of photos and first-hand interview accounts. 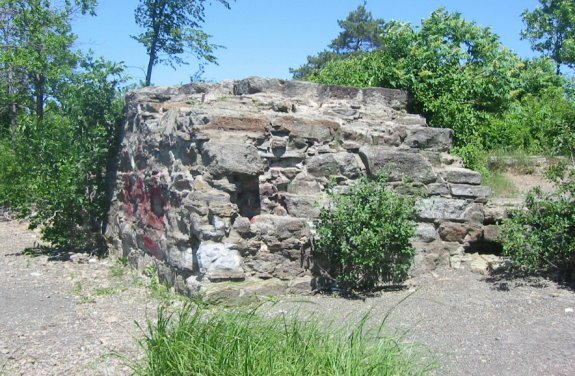 If you have been a regular visitor to Westboro Beach over the years, then you have likely seen the ruins which still exist to the east of the beach, in front of the Kitchissippi Lookout parking area. 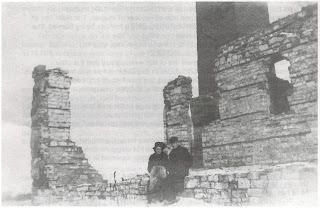 The ruins were much more prominent in the early 1900s, but over time have disappeared as the area has grown and changes so much. 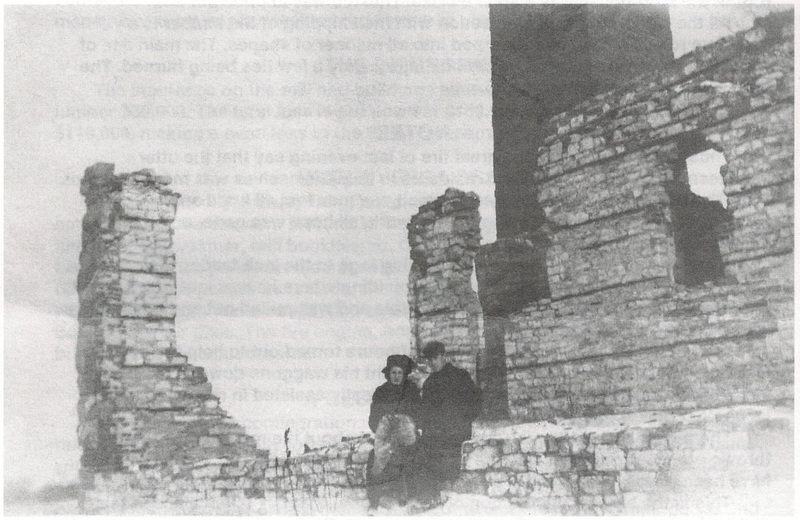 Ruins of the boiler house and brick chimney, circa 1900. 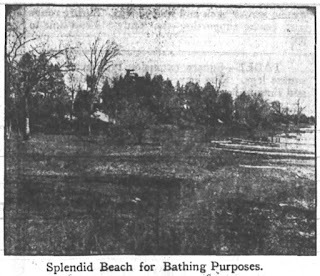 An early photo of Westboro Beach, May 13 1911.
seen just near the top of the photo, in the centre. and Churchill Avenues can be seen in behind. River, going towards the log booms. I hope you've enjoyed the history of the mill which is so long gone 129 years now, but can absolutely be credited with creating Westboro, and bringing its first residents here. It's interesting to think how the area may have developed without it, certainly it would be different! It's great we still have some ruins from that massive fire from so long ago, a landmark to such a distant era in our area's past. What may be most tragic, however, is the lost link to the man responsible for all of this - the Hon. James Skead. After Skead passed away, all his land holdings in Westboro dispersed, and the mill burned and gone, the residents of the area in 1899 decided to change the name of the village too. Skead's Mills became Westboro, and the name was nearly forgotten. A few years later the Ottawa Land Association named its western-most street in their Wellington Village subdivision for Skead, the present day Western Avenue, which was then the western border of Ottawa, separating it from the Township of Nepean (the east side of Western was in Ottawa, the west side in Nepean). However even this name was later lost before annexation in 1950, when the name was changed to Western. The last link to Skead is in the name of the tiny street connecting the north ends of Fraser, Mansfield and Westminster; one of Ottawa's smallest streets, with no houses actually fronting on to it, a fair distance from the old mill site, and oddly enough on land which Skead never owned, surprising considering the quantity of land he did own. It is unfortunate that Skead is not acknowledged in Ottawa, let alone the community, in a grander way, considering all of his significant contributions during the 19th century. If we can look to him as being essentially the founder of Westboro, surely we should be doing more to recognize his importance to our community. In my eyes, it is long overdue! Civic, fraternal and sporting clubs have long been a significant part of Westboro's social fabric. Somewhat sadly, modern society has seen a drastic decline in the prevalence of many of these organizations that were the centre of social life in the first half of the twentieth century. Recreation and entertainment options have morphed substantially over the past 100 years. Recently, I was told about a sporting club which existed for only a few years during the Great Depression, but surely can be considered one of the most surprising, unique and intriguing stories in Westboro's history. Would you believe that Westboro once was home to a rifle shooting club? That held its practices inside All Saints Church on Richmond Road? And which was made up entirely of teen-aged girls? It's true!